This is a continuation of the series of articles which seeks to investigate which states are international medical graduate (IMG) friendly. The concept of IMG friendliness has been around for a long time and has come to denote places or programs which tends have a portion of foreign medical graduates as residents. The following article deals with psychiatry residency only and the reader is directed to the main page of the subsection if they want to read about other specialties. Psychiatry belongs to a family of specialties that has shown plateauing and stagnation as far as increase in residency spots, which is why it becomes imperative to apply wisely and choose places well. 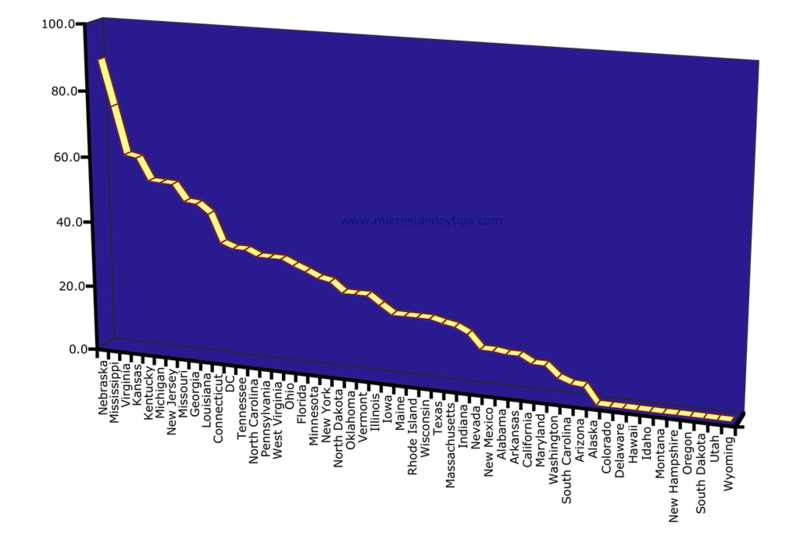 The states have been listed on the abscissa and include the all continental US states and the percentage of IMGs in the state are depicted on the ordinate. The data is compiled from NRMP, results and data section. You can click on the image to zoom in. Given below is a list of Top 10 worst states for an applicant seeking psychiatry residency and excludes the common obvious choices like Alaska, Hawaii etc. The reason I have included the ones listed above, because they are states where foreign graduates still tend to apply. Also, remember some states have only one university, which may not have post graduate psychiatry training, and therefore get delegated lower on the list. Connecticut came in at number 11 and DC came in at 12. It is interesting to note that this specialty also shows a gradual drop from the top to the least as opposed to some subjects which have a step ladder pattern. The implication of such finding is that overall, these gradual slope subjects have a better chance of accepting foreign medical graduates because the area under the curve (AUC) for similarly proportioned plotted graphs will be more for gradual slope than abrupt cut offs. Caveat: The caveat remains the same, remember these are percentages and can be influence by individual number of spots. however, this list will help curb unnecessary spending and save money in application costs by informing the applicant of those states, which have low or none foreign trained residents at the same time, enhancing the chances of matching by applying to the correct states. Go back to the main page of this section to check out other specialties. If you want to receive updates and stay in touch join on Facebook or follow me on Twitter! Can someone please tell me what the usual score Step 1 and 2 for an IMG should be to apply for a residency program in psychiatry?